A surprising stone hideaway ensconced among the hills, Masseria Susafa is a corner of Sicily where time passes slowly and space becomes limitless, a magical place where you can get lost to rediscover yourself. Masseria Susafa is strategically located in the heart of Sicily, a few km from the Madonie Nature Park and one hour's drive from many cultural attractions: Palermo, Cefalù, the Valley of the Temples of Agrigento, the Roman Villa del Casale at Piazza Armerina, and stunning Sperlinga. The fascinating Sicilian countryside surrounds Masseria Susafa, a fascinating place now turned into a hospitality structure, which still preserves the memory of a time when days where spent on the fields and at night one returned to the sheltering quiet walls of the great farmhouse. This rural heritage is kept alive by the Saeli-Rizzuto family, farmers and landowners for five generations, who have coupled the austere structure with the pleasures of cosy and refined hospitality. Time flows slowly at Susafa and the wide spaces of the Masseria provide the perfect backdrop for leisure moments, while the large fireplace warms the intimate lounge area. The ancient cellar is now home to the Wine Bar and the Hi Fi - Home Theatre room. The large terrace commands a grand view of the surrounding countryside, while the swimming pool provides a cool break when the surrounding hills turn golden. 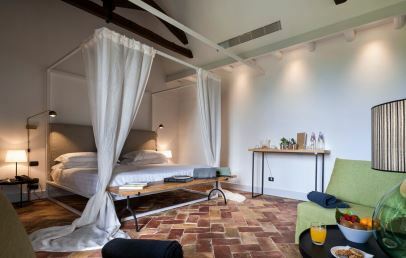 Wooden ceilings, floors in cotto tiles and original décor: the 18 rooms and Suites of the Masseria Susafa join together the warm atmospheres of Sicilian country houses with the modern amenities and services. All rooms are located on the ground floor, except from the Grand Suite, and have a king-size bed (180x200 cm), bathroom with shower, hairdryer, air conditioning, complimentary Wi-Fi connection, no television, non-smoking rooms. Classic Suite – 45 sq.m., spacious accommodations with skylight on the roof, wood stove, sofa, kettle with coffee/tea set, door-window with direct access to the private garden. 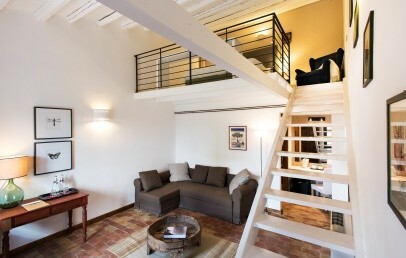 Grand Suite – 75 sq.m., spacious Suite on two levels, on the lower level a bed, living room and bathroom; on the upper level a living room and a private roof terrace, wood stove, kettle with coffee/tea set, two windows. 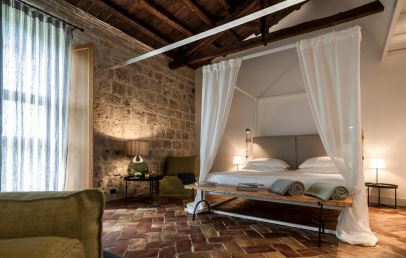 The old granary has been turn into the restaurant but has kept its name and fascinating ambience: exposed stone walls, floor in Sicilian cotto tiles, a large fireplace and warm lighting. The Granary uses super fresh produce, sourced locally or grown on the estate, and pays homage to the rich regional and local tradition with a carefully selected menu and a refined wine list. A staple product is organic olive oil Susafa. The Masseria also organises tailor-made cooking classes, during which our chefs will be happy to let you into the secrets of Sicilian cuisine. Vegan, vegetarian, gluten-free dishes and kids menu available on request. At the Masseria you will find information material to help you choose from a wide range of natural, historical and cultural attractions and activities available in the area. Activities include the olive harvest (between October and November), nature trails and horse riding along the paths in the Madonie Nature Park, led by an authorised guide. Wi-Fi connection, the use of the pool and private parking are available to guests free of charge. Welcoming rooms with a simple décor, join together the warm ambience of Sicilian country houses with the comfort of our days. 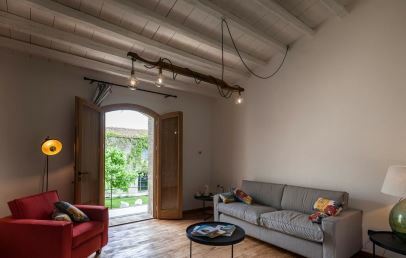 The rooms are converted from the old homes of the sharecroppers and their families and have wooden ceilings, cotto tile floors and original decorations. 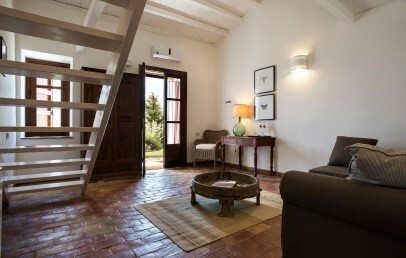 These double rooms are located on the ground floor and have a door-window with access to the garden of the Masseria. They have a bathroom with shower, air conditioning. No TV in room. 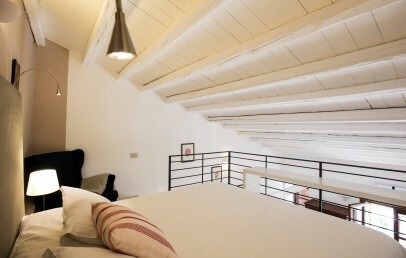 These rooms have two levels, a door-window, one windows and direct access to the garden of the Masseria. They have a mezzanine floor with double bed, living area with sofabed (3° bed), bathroom with shower, air conditioning, kettle with coffee/tea set. No TV in room. 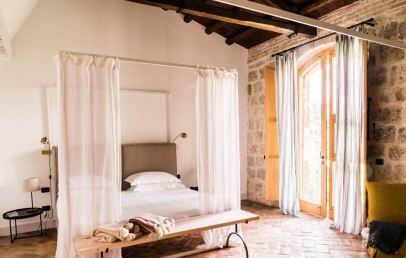 These double rooms are located on the ground floor with one window and a door-window that leads out to the garden of the Masseria. They have a bathroom with shower, air conditioning, kettle with coffee/tea set, armchair. No TV in room. Welcoming and big Suite with warm atmosphere and modern comforts. 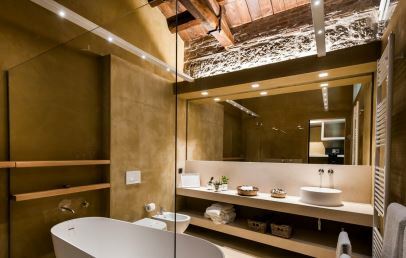 This Suite is recommended to couples looking for privacy and desire to fully enjoy the accommodation spaces. 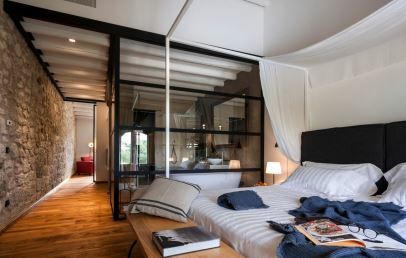 The entrance of the Grand Suite is on the ground floor with direct access from the garden and it is distributed on two levels. 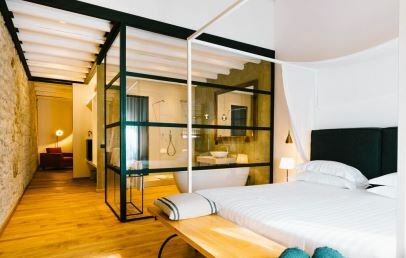 On the lower level is the double bed, a living room and a bathroom with shower and on the upper level a living room and the private roof terrace. The Grand Suite offers a wood stove, kettle with coffee/tea set, air conditioning and no TV. Welcoming accommodations with a simple décor, join together the warm ambience of Sicilian country houses with the comfort of our days. These spacious Suites are located on the ground floor with a door-window with access on the private garden and with view over the surrounding hills. They have a skylight on the roof, a bathroom with shower, air conditioning, kettle with coffee/tea set, sofa, wood stove. No TV in room. Only for Charming customers: welcome drink on arrival and 2 bottles of water in the room!